Putting The Boot In - But Which Boot? The world is buzzing about the World Football Cup being held in South Africa and mega events such as this present global opportunities for digital marketers. Neilsen details how the shoe giant Nike has undertaken a very effective piece of ambush marketing, no doubt to the chagrin of the major event sponsors. By monitoring the social media buzz they had noted that it was their brand that were most associated with the World Cup, even more than the official partners and sponsors. Nike's "Write The Future" campaign neatly gazumped that of Adidas by capturing 30+% of the Buzz while the official sponsor has thus far only registered a little over 14%. Carlsberg Beer have done something similar, bettering the official sponsor, Budweiser. According to Alex Burmaster, vice president of communications for Nielsen. "Social media has made ambush marketing easier, simply because of the virality of it. Some people call it an echo chamber." FIFA is not taking this lying down and at last count their lawyers have filed 2,519 cases globally against parties it accuses of ambush marketing. Some social media platforms themselves are suffering as a result of the World Cup. Twitter appearing to be feeling the strain. Track activity by topic, players, or team using CNN's Twitter Buzz. There are reportedly 150,000 tweets per hour per game; no wonder Twitter is creaking. 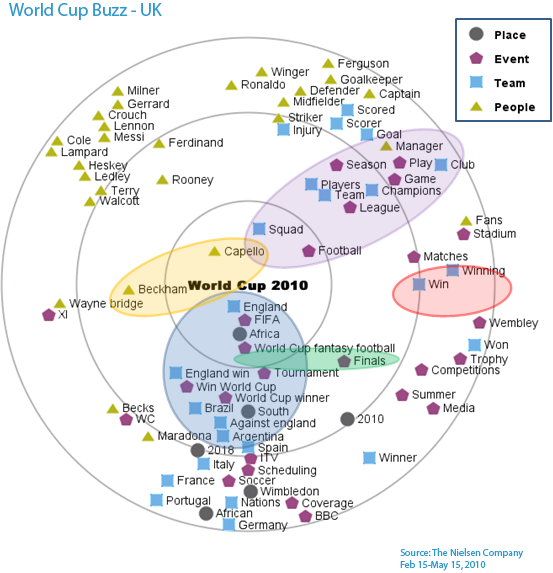 Neilsen has also used Brand Association Mapping to identify the differing perspectives of the Cup between countries. Note the UK example below. The words "winning" and "championship" reveal high expectations of their team. Click on the chart to enlarge it. There is an increasing vehemence in the manner that traditional media are pursuing blog owners who reproduce their content. Take the recently reported case of the Las Vegas Review-Journal which is in litigious mood and according to an LA Times article is taking some 30 websites and blogs to court. It raises the very important question - what is fair use? Plagiarising large blogs of content from a third party site or publication is certainly not fair use. If however one draws attention to the original; reviewing and rewriting certain elements in the process, then this would appear to be deemed acceptable. Chris Crum of WebProNews quotes attorney John Burton "I strongly recommend receiving written authorization from the copyright holder prior to redistributing their work or link, especially if there is a commercial interest in why you are using the work"
What all of the above really proves is just how threatened traditional media are by the rise of citizen journalism in the digital age. It is quite appropriate that mainstream media who pay for, or commission, content should expect a financial return through its use. This after all is their core business. However it is very much a case of trying to close the gate after the horse has bolted as many of the global and local news stories now break through citizen journalism sources rather than traditional media. Nothing is going to change this as it is now an established societal norm. Perhaps the final word should be this video which has been viewed some 10 million times on YouTube. There is a constant drilling and tapping through our condo walls as I write this. It is the sound of the Singapore government's high speed broadband initiative as they lay and connect free fibre optic cable. This will be completed by 2012 and I, as a resident, will have not had to pay a penny to access this service. These higher fixed connection speeds will mean an even higher adoption of broadband, provide a greater range of services capabilities and according to a new survey by Pyramid Research, boost service revenue to $5.1 billion by 2014. In China the broadband commitment is as impressive. According to a government white paper published on June 8th, China has invested heavily in Internet infrastructure construction. "From 1997 to 2009 a total of 4.3 trillion yuan was invested in this regard, building a nationwide optical communication network with a total length of 8.267 million km." " By the end of 2009 Chinese basic telecommunications companies had 136 million broadband Internet access ports Internet access to 99.3% of Chinese towns and 91.5% of villages, and broadband to 96.0% of the towns." In New Zealand the government is attempting to get a national ultra-fast broadband (UFB) network up and running but have thus far been frustrated by the actions of its major Telco. They intend spending $US1 billion on the UFB. Meanwhile the UK is still trumpeting a plan to roll out of 2mps to every household. One of their new ministers, the Right Honourable Jeremy Hunt MP has described this target as "pitifully unambitious." and he is correct. To put the British strategy into context, Korea aims to have broadband that is 500 times faster. And then of course there are the costs that Internet Service Providers load on to consumers. In Singapore all plans provide for 'unlimited' use and are based on speed. A basic 6mps service costs a mere $Sing 34.95 per month and comes bundled with other goodies such as free TV viewing of the English premier league. In New Zealand pricing is based on limited data use. For $NZ39.95 a miserly 3Gb can be used, at speeds that are nowhere near as fast as Singapore's. The cost of this limited service is obscene! When you add phone line costs the real cost in NZ for the 3Gb is around $NZ90 per month.